I needed an education. I was a hayseed from Kansas, had never seen the ocean, never ridden in an airplane and my parents couldn’t afford college. I had started applying for scholarships, but I really had no idea what I was doing and I certainly had no idea what they did at the Naval Academy. My closest relative in the military was a cousin in the Coast Guard. I’d like to say that I had grand dreams of Command at Sea, and all of the things associated with that, but basically, I needed a “full ride” [and I thought the United States Naval Academy might provide it]. I’ll never forget that day when we got the telegram. My father opened it while I was at school. He was in a hurry, but he took the time to grab the nearest thing to write with, which was a green crayon, and he wrote me a note — “Congratulations. Proud of you, son”. He was a tough man, and I can’t remember him ever telling me that before that day. When I got that appointment [to the Naval Academy], there was no question in my mind as to whether I would accept it. It wasn’t, “Do I really want to do this? ‘… I don’t think I hesitated for a millisecond. I was 17 when I got on the bus to Maryland, and 2 days later, I was raising my right hand with a bunch of other bald guys in jump suits. It was a real rude awakening — an eye opener. I was a long way from Kansas, Toto! 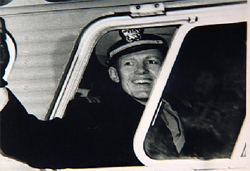 I graduated from the United States Naval Academy in 1964, married my high school sweetheart and we headed for Pensacola, and Navy Flight Training. I felt very, very lucky to get into flight school. At the time, maybe 1 in 3 applicants got to go — I got down there and really enjoyed the airplanes. I fell in love with them. Through no fault of my own, my first assignment was F-4 Phantoms, which was “the plum assignment”. They were the hottest thing flying at the time. I went to Naval Air Station Miramar for the Replacement Air Group, which was Fighter Squadron (VF-121/Pacemakers). 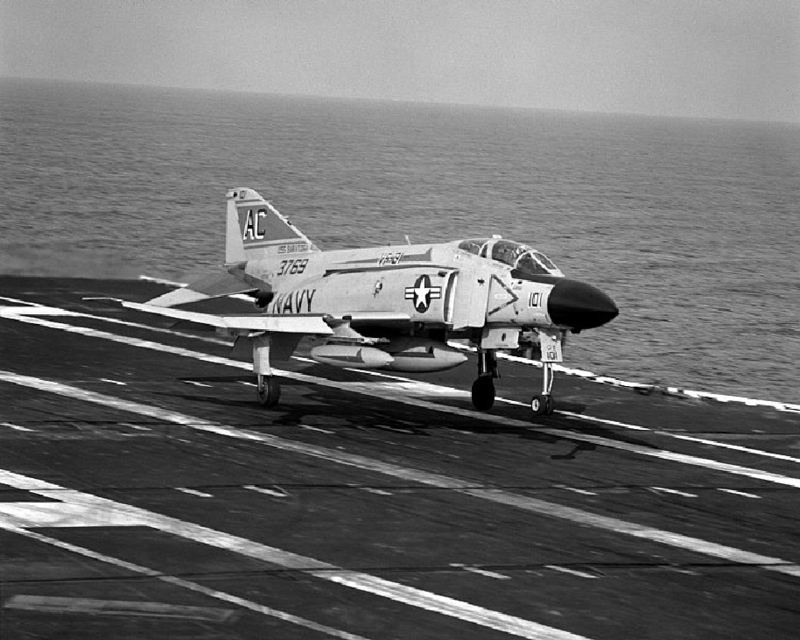 I was fortunate to become one of the early founders of the Navy Fighter Weapons School “Top Gun”, flying some of the first adversarial flights in F-9 Cougars. A bunch of guys went to the beach looking for girls and drinking, and I wasn’t a very big drinker, so I decided to see the island. I rented a Vespa motor scooter and drove out towards Diamond Head. I looked behind me for just a second and suddenly I was “bore-sighted” on the back of a parked 18 wheeler. I slid right under it. My ankle was trapped between the body of the scooter and the truck. I couldn’t walk, so I hobbled to the closest house and knocked on the door, and this lady said, “come on in, I’ll take you to the hospital.” When I got to Tripler, the Army hospital, the Doctor took a couple of x-rays, put this huge cast from waist to toe and said, “You can go to Ward 7B. That’s where all of the other broken bones from motorcycles are.” I couldn’t believe it — there were like 150 guys with broken bones from riding motorcycles around Hawaii. I told the Doc, “I can’t go to Ward 7B, I’m a fighter jock and I need to go to war.” The Doc said, “No, you don’t need to go to war, you’ve got a broken ankle.” I wasn’t about to miss everything I had trained for, so I called the ship. The Ship’s Doc wasn’t there, so I talked to the Corpsman on Duty. We managed to convince the Army Doc at Tripler that the Ship’s Doc would accept full responsibility for my safety, if he would send me back to the USS KITTY HAWK (CVA-63). The Doc gave me a set of crutches, and sent me to the ship in a cab. I got back to the ship, hobbled up the gangplank, and worked my way into sick bay where I spoke with the same Corpsman. He sent me down to a berth to rest, where I passed out. The other officers arrived back and couldn’t find me, so they formed a search party and went looking everywhere on the island. No luck. I slept in the sick bay that night and woke to the sound of the ship’s engines warming up. I was still in a ton of pain, but I knew we were about to get underway, and I still hadn’t spoken with anyone. I was in so much pain I couldn’t move so I started banging on the hatch with my crutch. Eventually, this Sailor opens it up to find me and pretty soon the CO of the Squadron is standing at my door. “Plumb, I had 17 pilots in the ready room and now I’ve got 16. I can’t fight a war missing a pilot. I’m sending you home”. The Det was composed of a hundred mechanics and a dozen chiefs and we repaired battle damage and installed new electronic counter-measure equipment. We’d have from 7 to 10 airplanes at any given time. Now, I wasn’t a qualified Test Pilot, but we needed to test the repaired birds. I didn’t have much use of my right leg, meaning I couldn’t push on my right brake, so I used my left one a lot. To turn right, I would make 3 left turns! They would actually hoist me up on a forklift to fly the airplane because of my cast. I flew 74 successful combat missions, still limping on my right leg. It was only 7 months after my injury, but I had a week left and was heading home. And then – on the 75th mission, I was shot down. The following is excerpted with permission from CAPT Charlie Plumb’s incredible POW story of 2,103 days spent in communist training camps in North Vietnam. 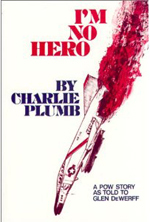 His story and his stunning recovery are memorialized in his autobiography, I’m No Hero, available through www.charlieplumb.com. “Gary and I were much too far inland to expect any successful Sea Air rescue. There was no need to get a chopper shot down with three or four men in it. We would be landing near the village and would not be able to evade for five minutes, much less the forty-five it would take for a rescue team to get there. I’d seen helicopters shot down during rescue operations for pilots who had already been killed or captured, and I would not initiate such an incident. If I were to make it out, it would have to be unassisted. HOW DID YOUR NAVY CAREER PROGRESS AFTER YOUR TIME AS A PRISONER OF WAR? Well, I returned home to a divorce and a different country. I took the six months of leave I had accrued while I was a POW. Then, I resigned my active commission and took one in the Reserves. I took A-4 training and re-qualified to fly. I joined the reserve A-4 unit in Millington, TN, stayed there for 3 years when we transitioned to A-7’s. By this time, I had written a book and was on the speaking circuit. I was flying civilian airplanes during the week and military airplanes on the weekend. I was living the dream. Then the unit moved to Dallas. I was living in Kansas and could get to Memphis, but it was tougher getting to Dallas. So I traded my brown shoes for black ones. I was in several great jobs in the Naval Reserves. I had two commands as a commander and two as a captain. When I pinned on oak leaves, I was selected as Reserve Readiness Commander of the states surrounding Kansas and I was Reserve Commanding Officer of the maintenance unit in Wichita. As Captain, I became the Reserve Commanding Officer of USS CORAL SEA, then the Reserve Wing Commander of Lemoore NAS flying F/A-18’s. “I was finally back in the saddle!” I retired in 1992. In terms of the beauty of flight, once I was on a cross country flight near Seattle, and around 5000 feet, I just broke out of the thick clouds with the sun rising, and I could see five mountain peaks gleaming back at me. Just incredible. Other memories would be the dedicated people that I’ve known. Sometimes you don’t recognize the value of people until you’re in trouble. There have been some amazing people in my life and career. Too many to describe, from John McCain who arrived at our camp with 7 broken bones, to James Stockdale, to Seaman Doug Hegdahl, who returned home to tell our families that we were alive. But, to narrow it down to one, Bob Schumacher passed a wire through a wall to me when I arrived at the Hanoi prison camp. He had been there two years, and I couldn’t even fathom two weeks there. He taught me the code so that I could communicate with the other men. Just having that connection was a lifesaver — just having someone who cared about me meant everything. When you get in a situation like that, you really get into the baseline existential question — am I really alive… is this really happening to me… or is this a hallucination? If you’re in solitary confinement in a dark cell, where you can’t see anyone, where you can’t see your hands in front of your face — there’s no one to validate that you’re even alive. The tug on that wire — that ability to communicate — gave me great hope. It wasn’t the information or the data that did it — it was the validation of life from another human being. Of all the people in my military career, Bob Schumacher stands out as the one person who helped the most. He taught me the ropes in the camp and showed me that things would be ok. When I still had the full length cast on, before I could fly missions, I was the Officer In Charge of this Detachment at NAS Cubi Point in the Philippines. We were always looking for fun stuff, so we challenged the base softball team to a game. Because of the full cast (waist high down to a little toe hole), I was the umpire. I’m behind the plate with this Second Class Petty Officer (ADJ2) running beer for us. He was a good southern guy and wanted to keep me happy, so he was moving fast. But my leg really started to swell and hurt while I was behind the backstop. So I propped my foot up on a mound of dirt to reduce the pressure. I was standing there calling balls and strikes and my leg is now itching like it’s on fire, and there’s no way to get in there and scratch it. I looked down to see lines of ants crawling in the toe hole and up into the cast. I asked him what to do. He said “I”ll fix it”, and poured a cup of beer down the cast. For the next two weeks, I had a leg that stunk like stale beer, but it did stop the itching. Mainly, it’s been Public Speaking. I joined the speaking circuit shortly after returning home. Today, I still give about 80 talks per year. Also, the Navy Reserves, and a number of charitable and flight-oriented organizations. For example, I’m on the Board of Directors for LightSpeed, a headset company for small aircraft and I’m active in the Experimental Aircraft Association. What’s really important? First of all, I think everyone should serve, not necessarily in the military, but the essence of life is serving your fellow man. And so, to anyone who is serving, especially in the Navy, I would say, “Don’t minimize the tradition of serving”. While boats go further and planes fly faster, the tradition is the same. If you try to minimize those who have gone before and say that their service was somehow different or lesser, going all the way back to John Paul Jones or General Macarthur, if you minimize the tradition that they were part of — then it is difficult to stay focused on performing your duty to your country. We’ve followed in the footsteps of exemplary men and women, and they have created a culture for us, taught us what to do in uncertain circumstances. The culture and the long-standing tradition places expectations on each of us to meet or exceed the greatness of those who have gone before. HOW HAS TOGETHERWESERVED.COM HELPED YOU MAINTAIN YOUR MILITARY BEARING AND THE BOND WITH YOUR FELLOW SERVICEMEN AND WOMEN? It has answered a thousand questions about my old units, the guys and gals I’ve served with, and places we’ve been and the things we’ve done. It has truly enhanced my memories of some wonderful times.